In volleyball, Tuesday night the No. 5 ranked Rivercrest Lady Rebels defeated James Bowie in three straight. 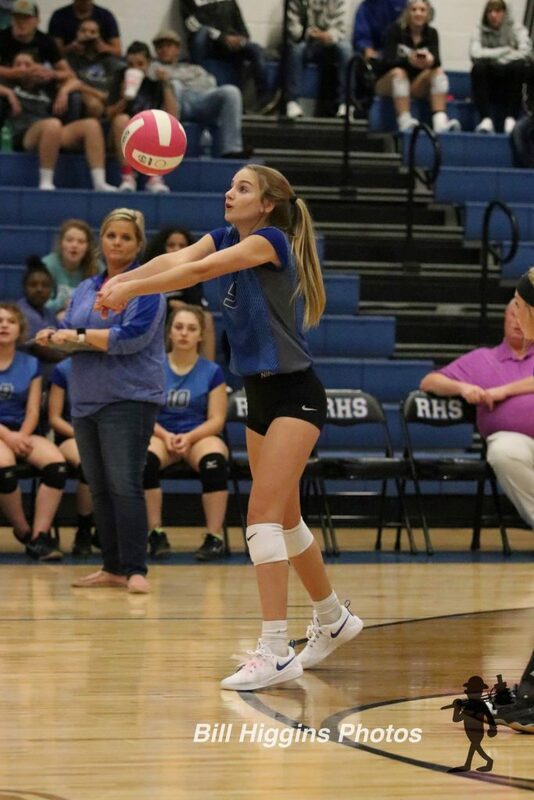 The Lady Rebels are 9–0 in the district and still have not lost a set. The Paris High Lady Cats swept Pittsburg to open up the second half of district play. Macy McAmis had 12 kills for to lead Paris while Tori Weatherford finished with 15 assists. Paris will be at North Lamar on Friday night. And the No. 8 ranked Prairiland Lady Patriots dropped their first district game as they were swept by Commerce on the road. It will be a top 20 matchup Friday night at Wildcat stadium when the No. 9 ranked Paris Wildcats host the 19th ranked Celina Bobcats on 101.9 KBUS. Across town and on Mix 107.7, the North Lamar Panthers will Face off with number one ranked Argyle. Both games start at 7:00 pm with pregame at 6:30. Friday Night Football: Mt Pleasant is at home against Marshall at 7:30 pm on KLAKE 97.7, Pittsburg heads to Pleasant Grove at 7:30 pm on STAR 96.9, Sulphur Springs is at Ennis at 7:30 pm on STAR 95.9, Daingerfield hosts Ore City, Gilmer is at Spring Hill, Hughes Springs is at home against Atlanta, Mt Vernon will host Jefferson, and it’s Homecoming at Paul Pewitt, as they host New Diana. The Dallas Stars dropped their first game of the season last night as they lost to the Toronto Maple Leafs 7–4. Tyler Seguin finished the night with a goal and three assists for Dallas. And the LCS is all set in baseball as the Red Sox defeated the Yankees 4–3 last night. Boston will play Houston beginning Saturday night. In the National League, it will be the Dodgers and Brewers going at it. That series will start on Friday night. In the ALDS last night, Boston eliminated New York with a 4-3 win over the Yankees. They now advance to the ALCS against the Houston Astros with game 1 set for Saturday at 3:09 pm. Game 1 of the NLCS features the LA Dodgers at Milwaukee at 7:09 pm Friday night. The Dallas Cowboys are signing safety Darian Thompson off the Arizona Cardinals’ practice squad. He was a third-round pick of the New York Giants in 2016. The Cowboys are adding cornerback C.J. Goodwin off the Cincinnati Bengals’ practice squad as well. The Jacksonville Jaguars, plagued by injuries at running back, have signed free agent Jamaal Charles to a one-year deal, the team announced Tuesday. The move comes after No. 3 running back Corey Grant was placed on injured reserve with an injury in his left foot. Grant had been pressed into playing time with regular starter Leonard Fournette out indefinitely because of a right hamstring injury and No. 2 back T.J. Yeldon playing with a nagging ankle injury. PITTSBURGH Steelers wide receiver Antonio Brown faces two lawsuits from an April incident during which Brown allegedly yelled at security and threw items from inside a South Florida apartment and off a balcony. Both lawsuits are for “damages in excess of $15,000, exclusive of” attorney fees and interest. A guardian of a two-year-old boy is suing Brown for “intentional infliction of emotional distress and assault” after items flung from the 14th floor of The Mansions at Acqualina nearly hit the child, according to Miami-Dade County court filings. The owner of the multimillion-dollar condo Brown leased also has filed a case against Brown for damages and breaching the apartment agreement.